Activists Forever? explores the consequences of political involvement on an individual’s life. While much of the research in this area has focused on the motivations of entire protests groups, the editors of this volume propose an approach that focuses on actors. This book examines political involvement’s socio-biographical effects, or the ways in which political commitment generates or modifies dispositions to act, think, and perceive, in a way that is either consistent with or in contrast to the results of previous socialization. The contents explore what political involvement leads to rather than what causes involvement. Using a variety of case studies, this collection of essays provides global coverage with a focus on participation in major protests in the 1960s and significantly broadens our understanding by looking outside the United States. 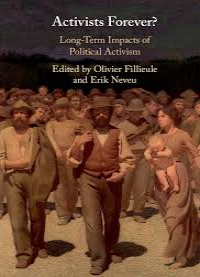 These essays look at the lasting effects of activists’ knowledge, connections, and symbolic capital on their future participation in politics, as well as their personal and professional lives. Muchas felicidades por LAOMS, a todas y todos los que hacen posible elaborar este medio de comunicación les deseamos un 2019 lleno de éxitos, Alicia E. Eguiluz.